Emily had clinic on Thursday after she was in bone marrow all day on Wednesday because she was needing platelets but after counts were done and heart rate of 150 she needed blood. 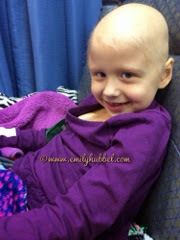 So dad and Emily spent the day in the clinic on Thursday! I took her on Friday bc she needed to get platelets and they didn't want to do both on Thursday because of her blood pressure issues! No reactions from the platelets but after they were finished of course her blood pressure decided it was going to be high. They waited it out and it went up more and then gave lasix (only a very little but because We do not like using lasix) to get it to come down. After another half hour it started to come down and she was able to leave. So another long day yesterday! Next week she will have clinic on Tuesday and Friday to see what her counts are doing and Tuesday they are going to do a nuclear heart scan to see if they can see what is going on with her heart rate. Emily is becoming very emotional about the time spent in hospital lately and is tired of being accessed all the time. We hope in the next couple of weeks that will become better. And she will have less time in the hospital but for now we will continue what we have to do! Please continue to keep her in your thoughts! Oh this is so hard! Praying and praying for you Emily.